I admire the fact that you want to paint your own. The possibilities are endless! Since these Portraits are custom you will need to send me a photograph first and specify which “Level” you want. They work well for all ethnicity groups. Animals do not work well for levels lower than 5. Why? you ask, because animals have color in addition to shadows. These portraits are based on shadows and highlights, Let me put it this way… If you have a Yorkie for instance and wanted level 1 he/she would turn out gray and black with a tiny amount of white in the eyes. But the gray and black would be based on color patterns more than shadows and highlights. This results in the face looking flat. You won’t see the shape of the nose and face, you would just see the darks and lights based on color not shape. When I receive your photo, I will let you know if it will work for your chosen level or not. Things to avoid, Uneven lighting on the face like large shadows caused by hats or other things. Low resolution or long distant photos. Minimum of 1MG to 4MG head and shoulders photos are preferred. The higher the “Portrait Level” the higher resolution is needed. I always crop to include only head and shoulders. If I say that your photo will work you will need to let me know what level you want and send me your mailing address. I will then send you another email that contains a link to a secure site. Click on the secure link in the email to pay. I will usually have it in the mail in about two days. Want it sooner? Let me know and I will send you all the files via email. You will not receive any hard copy materials. 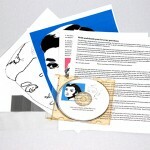 CD containing…Basic Instructions, Canvas prep instructions, and Lined pattern in pdf format. 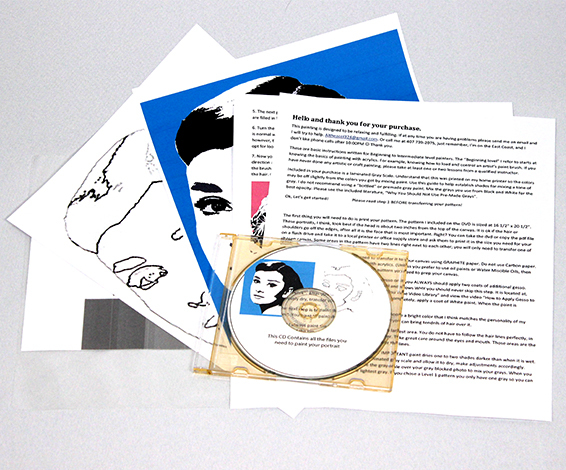 You can bring the CD to a printer or office supply store, or copy the pattern on a flash drive to bring to them. I will also include all other files mentioned below. Laminated Gray Tone Scale to be used to mix your gray paint. Printed – Black and white 8 x 10 print of what the finished painting should look like. This is your main reference photo to use during painting. Levels 4 and 5 will receive a printed closeup of the eyes. The printed images will help to compare the the color of my computer and printer settings to yours. Cost $45.00 for Level 4 or Level 5.
International You will receive all files via email. Nothing will be mailed. Sorry, postage costs too much.